Timber pallets and packaging remain the most sustainable and economical choice for the safe transport of goods, despite UK buyers experiencing 22 consecutive months of rising prices (Markit/CIPS UK Manufacturing PMI, April 2018) resulting in a 30% price increase in the last year. The UK’s position as a net importer of timber (second in volume, only to China) to meet domestic demand exposes the UK timber buyer to global market influences, impacting both price and availability. It is, therefore, important to appreciate the global context to understand our domestic market and 2018 has seen a number of factors combine to continue to drive timber prices and impact UK pallet and packaging timber supply. With such a sustained period of volatility, buyers are understandably demanding robust evidence to support supplier price negotiations. This information is therefore offered to assist timber pallet and packaging buyers grappling with the challenges and complexity associated with responsible procurement. All global timber markets are busy, with demand outstripping supply across all sectors simultaneously (sawn, pulp, chip, composite, construction, joinery, and biomass). The combined effect of this is to create ever greater competition for available supply with the inevitable result of increasing prices. Trade of softwood sawn timber has reached an all-time high: in 2017 an estimated 126 million m3 of softwood timber was shipped from forest-rich countries such as Canada, Russia, Sweden and Finland to markets with a high consumption of timber, including China, the US, the United Kingdom, Japan and Germany. Collectively, since the recession of 2008, international trade of timber has increased by as much as 50% and global prices have followed similar upward trends. The Q1 FEFPEB Pallet Timber Price Index confirms these increase with UK, Germany and Netherlands experiencing the steepest rises. The German HPE (http://hpe.tops.net/daten-und-fakten/holzpreisindex/hpe-price-index/), French CEEB and UK Poyry indices all similarly, corroborate the continuing upward trends. American timber prices have reached a record high and market dynamics are pushing buyers to look beyond their traditional domestic and Canadian markets as internal government policies implemented in November 2017, including a 20% import levy on Canadian imports, have seriously impacted on availability (an 8% reduction in imports is reported). Wildfires in the Pacific North West has further pressured supplies as they destroyed timber and limited sawmill output at a time when rebuilding programmes following hurricanes Harvey, Irma and Maria are driving demand. Despite evidence of a slowdown, China is now the largest importer and consumer of timber products: logs, sawn wood, and paper, almost doubled by volume in the last decade. Exports from the EU reached three million m3 in 2017 and China is now the largest single export market for major producers such as Finland. Other Asian markets, such as S. Korea and India are also of increasing significance, creating additional competition for available European volume. Currently, the majority, (66%) of the UK’s softwood originates from private sector woodland. With the Forestry Commission reporting a 28.2% year on year increase in standing timber prices, there may never have been a better time to sell. Even remotely located or previously considered, inaccessible mature timber is now of interest. However, the impact of this potential additional volume has, as yet, to be felt downstream. UK demand for timber is coming from an ever-expanding range of consumer and industrial sources. Building and manufacturing in timber is a fashionable choice, aesthetically and environmentally. Demand for pallets is also up. The UK Wood Pallet & Packaging Market Report (2016) commissioned by TIMCON, estimates 42.5 million timber pallets were produced in 2016, up 5.6% on 2015. For the members of TIMCON the UK’s Timber Packaging and Pallet Confederation this should be good news but there are many issues challenging their business of which timber price and availability were highlighted as the most significant in a recent survey. Even the strongest of customer relationships are being tested. In an industry where margins are already weak and the raw material cost is reportedly around 70% of sales price, any failure to pass on increased costs could exacerbate industry wide problems such as those already being felt in relation to labour shortages. The economy’s unpredictable influence on the sector is proving difficult to navigate. GDP has been rising and is expected to continue through 2018 (if, at a slower 1.2% rate) and construction activity and demand is generally improving in all EU countries and is supported in the UK by Government policies such as the Help to Buy scheme and the Million Homes by 2020 agenda. That said, there have been some regional variations in the private housing sector, with London new starts down on 2016 and March’s weather disruption has been blamed on the steepest fall back in construction activity since July 2016, according to the latest PMI survey. The ripple effect of the collapse of Carillion combined with March’s snow have negatively impacted the economy and are blamed for a £1.5bn decline in output in Q1, according to the Construction Products Association. This is viewed as a one-off disruption and order books remain strong especially out with London. It is believed that the drop in activity may have just masked shortages in the supply chain. UK sawmillers are reporting a lag of about a month, on the normal demand pattern, which has stimulated concerns that pressures on timber availability in Q1 will be further exacerbated when the habitual market seasonality comes into play. Competition for available logs is creating additional pressure on pallet timber availability and is likely to be the most significant feature of 2018. Rising log prices are driving the need to increase sawn timber prices, with steep increases anticipated for May and June. While higher prices in the UK market are again attracting interest from Baltic and Swedish suppliers (now recovered from flooding that limited access to extract timber safely from their forests in 2017), there are no new or alternative markets for buyers to turn to and UK timber buyers are faced with limited competitive alternatives (German, Canadian, Chilean at 20-25% higher prices and limited availability). 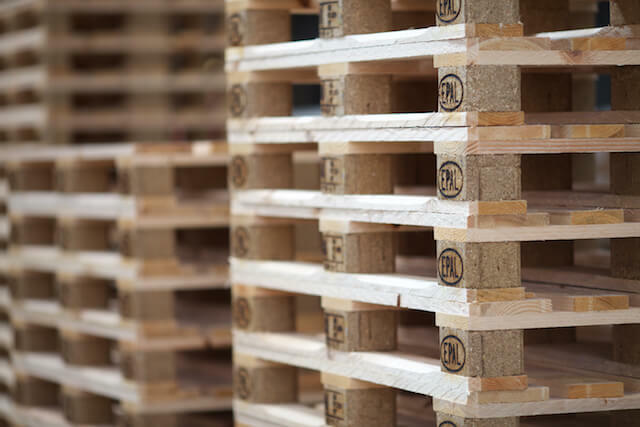 As buyers react to the volatile market there is growing sensitivity about the impact on pallet supply security and there is now evidence of some volume pallet buyers looking to increase orders in an attempt to build stock. In such a challenging market, experienced suppliers can deliver real value to the supply chain, if they are effectively supported to develop tailored solutions. If buyers adopt a willingness to be flexible with regard to their specification or pallet reuse and make time to engage collaboratively with a well-informed, effectively resourced, innovative supplier, they may just manage to minimise or offset the escalating cost and potential operational disruption. Support from an experienced Account Manager with a detailed understanding of their customers’ business and access to credible technical support will ensure reliable, safe and practical solutions are offered and may include pallet recovery and reuse, redesign or reconditioned pallet options.